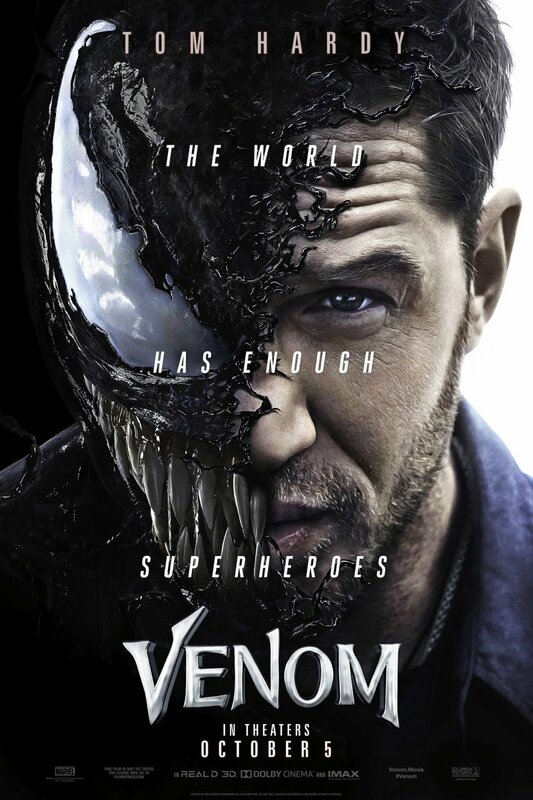 The official one-sheet theatrical poster for, "Venom." People are Friends. Not Food. In Venom, The Life Foundation led by emotionless mogul Carlton Drake (Riz Ahmed) has already done the legwork regarding where to find the symbiotes. They venture out into space, but the return journey results in astronauts crash landing back on earth and one of the symbiotes escapes. Drake’s sole purpose is to find a human host that won’t reject the alien symbiote, but his experiments have only resulted in death thus far. Meanwhile, investigative journalist Eddie Brock (Tom Hardy) has his own television program and is on the verge of getting married to his fiancé Anne Weying (Michelle Williams), but he throws all of that away when he has the opportunity to interview Drake and makes matters personal because he’s a stupid idiot. Six months later, Eddie is living off of burnt tater tots and beer in a shoddy apartment. Life Foundation scientist Dr. Dora Skirth (Jenny Slate) contacts Eddie about Drake’s morbid experiments. Eddie reluctantly and eventually decides to help, but contracts a parasite during his investigation. 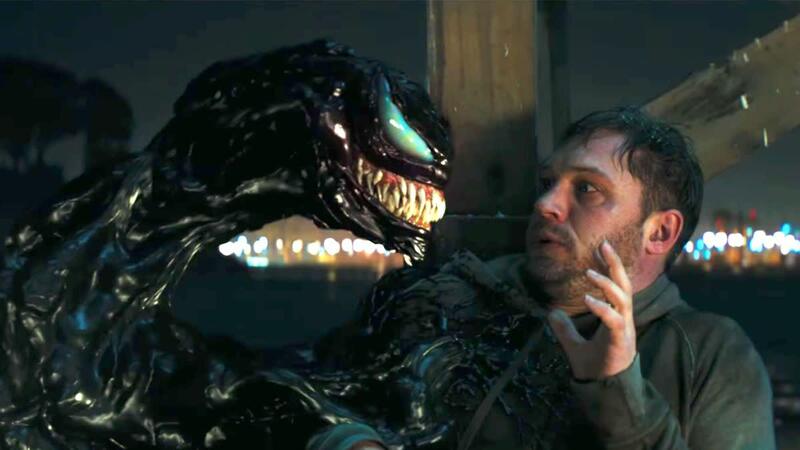 That parasite begins eating people’s heads and talking about, “turds in the wind,” and the Eddie Brock/Venom relationship is finally cinematically born without Topher Grace involved. The way Venom is purposefully ripped from its source material and is kept away from everything that makes the character worthwhile is questionable especially when the writers chose to introduce more symbiotes when the Eddie/Venom relationship is still in bloom. Over-complicating things to compensate for changing the character’s roots feels cheap for the fans. 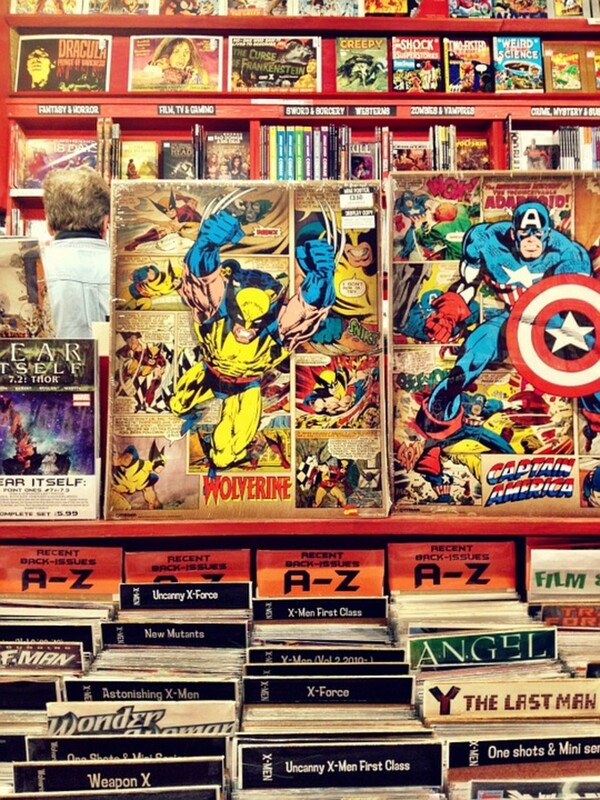 There is no Venom without Spider-Man in the same vein that there is no Joker without Batman or Sabretooth without Wolverine. The film is intentionally boring for a solid 45 minutes before Eddie’s first Venom encounter. You have to sit through Carlton Drake’s lame attempt at entertaining children and Eddie’s half-cocked effort at meditation. The performances are completely dry, as well. No emotion is portrayed by any of the actors as everyone drifts through the motions without a wrinkle in their face. Also, Eddie hides behind a bag of potato chips as the convenience store he frequents is held at gunpoint and then proceeds to purchase a sandwich and some Pepto Bismol without acknowledging anything; that’s important for some reason. The highlights of the film seem to be done on accident. Tom Hardy is trying with all of his being to make this performance and material work. It’s funny that IMDb and Wikipedia contradict each other regarding Hardy’s knowledge of the character; he either didn’t know a thing about Venom and took the role to appease his son or was a diehard fan before the film. Hardy shines in the restaurant sequence eating everything in sight, frantically trudging around the dining room drowning in sweat and scrambling from table to table shoving whatever he can into his face. He climbs into a lobster tank, sits down, has a conversation, and then eats a live lobster raw. The squeal he makes when he sees and hears Venom in the mirror for the first time is hysterical. "We're watching Flubber tonight, Eddie. And that's final." Venom also has his moments with his interactions with Eddie. 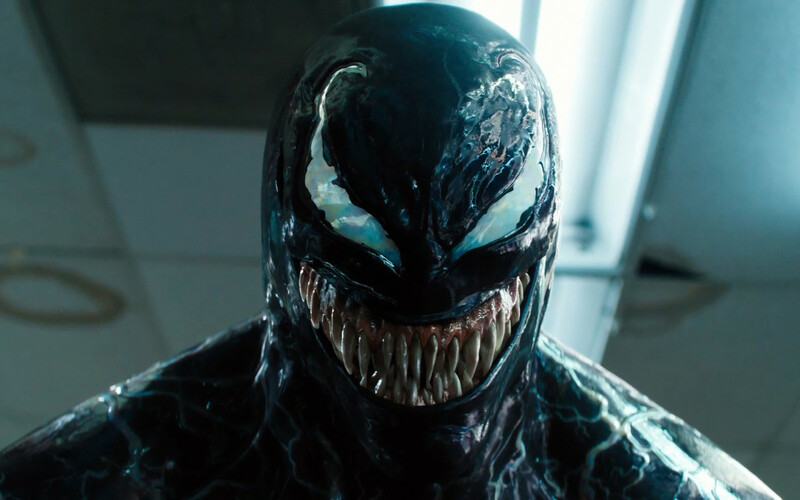 The dialogue is unbelievably poor throughout the film, but every once in a while it seems to work and Venom is accidentally cool despite, “being a loser from his home planet.” Venom just wants to eat people’s heads and inner organs while avoiding MRI machines and airplane engines because the results in him throwing a spasmatic tantrum. In the comics, Venom isn’t violent towards innocents, women, and children and he typically only attacks criminals and those who he thinks deserves it; similar to Ghost Rider. The film hints at that and the bond between Eddie and the symbiote obviously isn’t to the trusting heights you probably want it to be at, but the film tries to get the point across that it’s in the beginning stages. How Eddie’s cowardice and abandonment on life serves as inspiration for Venom to stay is beyond comprehension. 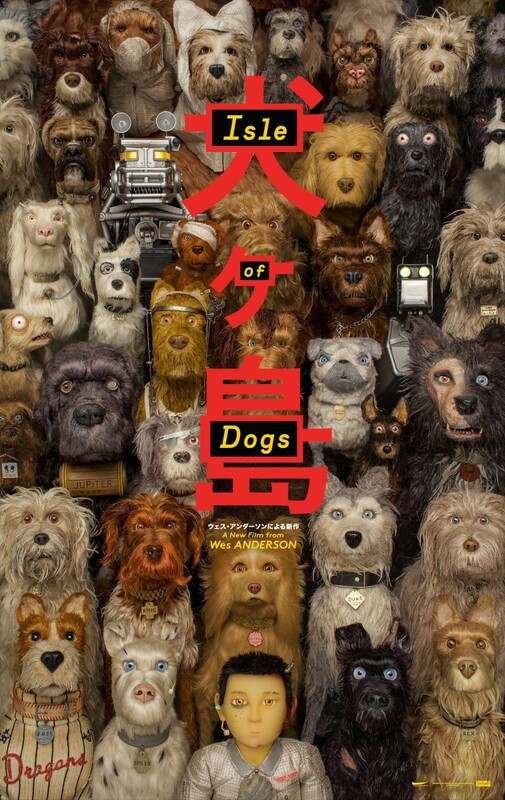 The film has this $100 million budget, but it still feels like it cuts corners regarding its special effects and action sequences. The CGI already feels outdated, but the SWAT team sequence and the heavy use of smoke seems like it was intended to allow the character to lurk around and attack in ways that the audience wouldn’t see coming. In the end, it feels like a cop out and an excuse not to utilize more of the special effects that likely ran them over budget. 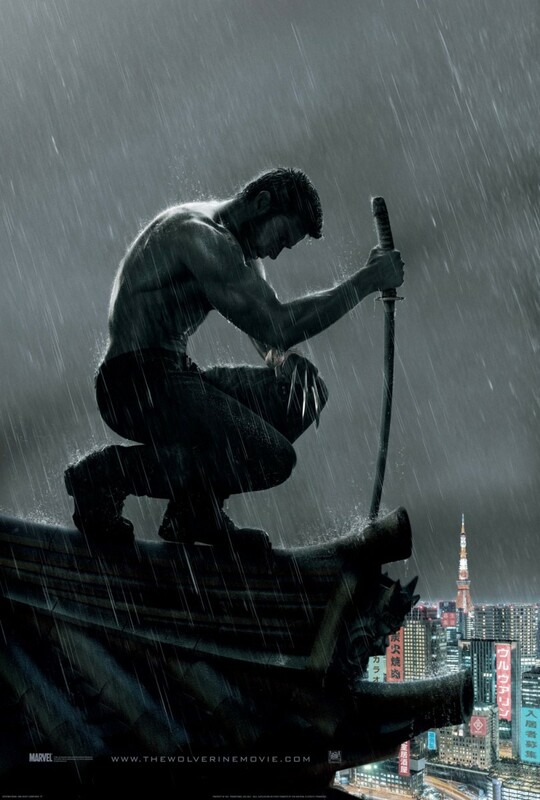 The final fight sequence is overwhelmed by under par CGI. The visuals are dark and blobby while the camera dizzyingly swerves around and the frame is incapable of showing all of the action coherently. The film already has a Transformers vibe thanks to the name of another symbiote named Riot in the film. While Riot was in the comics, talk of their home planet, other symbiotes, Riot being the leader, and desire to return home seems like it was ripped from one of Michael Bay’s disastrous yet financially lucrative sequels. The drone chase also seems like it should have been the action sequence the entire film is built around, but Eddie’s dialogue is so bad it ruins the cheesy, 90s action film aura the film seemed to be aiming for. "Your lungs are looking absolutely delectable this evening." There’s a limp endeavor at fanfare in Venom that rests within the Anne Weying character and the first of two after credits sequences. Anne’s scene is only for a brief moment in the second half of the film and the mid credits scene is so terrible that you’ll question why you stayed after in the first place. While it introduces a fan favorite character, the person they put in the role looks laughably bad and its execution is entirely underwhelming. For the record, there is another bonus scene after nearly 15 minutes of plain black and white credits. The second sequence is cool, but will likely be massively confusing to anyone not familiar with the comics or Spider-Man in general. Venom seems like it was something else when it first began. A decent version of the film feels like it’s out there somewhere, but what you get is something that isn’t true to the character. 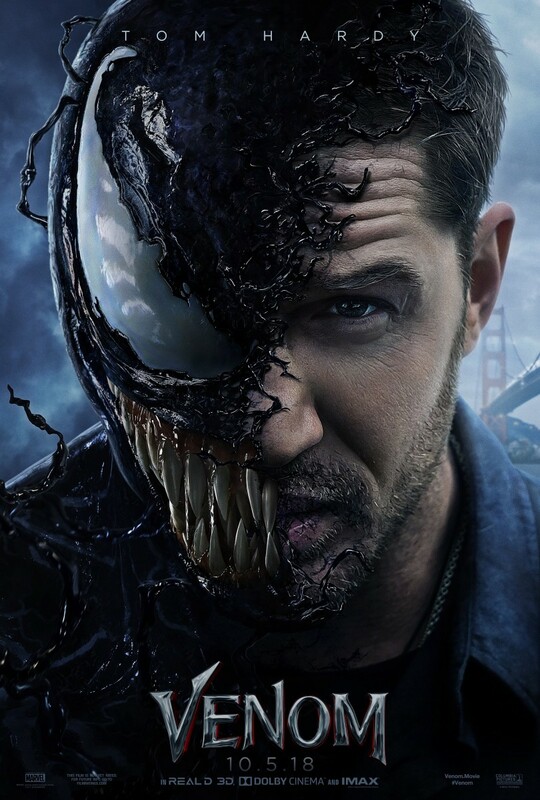 The film drags frequently over its two hour duration as Tom Hardy’s efforts to make the Eddie Brock character and the film work as a whole is consumed by the film’s lack of proof of pushing these boundaries the studio and director claimed it was going to. 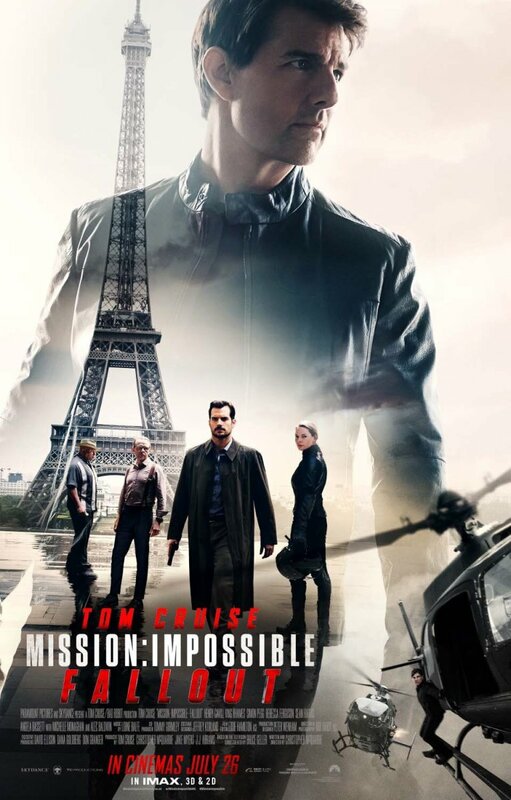 The performances are mostly flat, the characters are dull, and the dialogue is atrocious. The visuals feel like they’re outdated by at least a decade. There’s some enjoyment to be had in Venom, but when that gold nugget of delight is surrounded by multiple layers of horrendous elements it doesn’t seem worth digging through multiple layers of sloppiness and symbiotic crap in order to enjoy a handful of minutes of amusement. Venom is like one bite of prime rib wrapped in this ugly alien burrito with nothing but plain lettuce filler and predictable moldy cheese to compliment it. Tinder meet-ups are getting complicated these days.